$50 off your first visit! Click for a FREE consultation! We are Maine’s premiere med spa. Located in the wonderful city of Portland, our spa offers a discreet setting with plenty of parking. Additionally, we are staffed with highly skilled practitioners dedicated to our clients and their ever changing needs. We offer generous prices and never push our services…ever! Wrinkles and saggy skin happen to the best of us, but it should not prevent us from looking our best. If your face show signs of aging, give us 10 minutes to help eliminate those wrinkles and give your face a more youthful appearance. 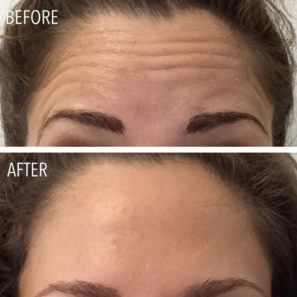 What does Botox® Cosmetic correct? What is Botox® Cosmetic (onabotulinumtoxinA)? Botox® Cosmetic is the only FDA-approved treatment that improves the appearance of moderate to severe frown lines and crow’s feet. This prescription medicine is administered by a trained and licensed physician via injections. Botox® cosmetics is the #1 selling product of its kind and has been used in over 11 million treatments since 2002. Injections of Botox® Cosmetic into the facial muscles which are responsible for frown lines and crow’s feet lines – temporarily reduces the activity of those muscles. The result is visibly smoothing of the targeted lines. Will it look like I have had “work” done? Maine Laser Clinic & Spa has an experienced physician performing the treatments, reducing the likelihood of facial expression loss. You can feel confident choosing Maine Laser Clinic & Spa for your Botox® needs. Our physician is certified and trained by Allergan; makers of Botox® and Juvederm. After Botox® Cosmetic injections, you can expect to see results days after treatment and further improvements within the following weeks. In clinical studies, physician’s report 74% of people have significant improvement one week after treatment and 80% had significant improvement on day 30 after treatment. Botox® Cosmetic treatment (also know as the “lunchtime” procedure”) is a quick, 10 minute procedure with no downtime. We will discuss expectations you wish to achieve and determine the best treatment plan to ensure optimal results. Clients can resume normal activity immediately after the treatment. Prior to receiving Botox® cosmetic injections, avoid using aspirin, non-steroidal anti-inflammatory medications (ibuprofen or naprosyn) St. John’s Wort, or high doses of Vitamin E supplements. These may increase bruising or bleeding at the site of injection. The most common side effects following Botox® procedures are related to the injections which are; swelling, redness, bleeding and bruising. Other possible side effects include headaches, respiratory infection, flu syndrome, temporary eyelid drooping, and nausea. If you are between the ages of 18 and 65 and have signs of aging or moderate to severe crow’s feet or frown lines, you may be a candidate for Botox®® Cosmetic treatments. Anatomy and physiology varies from person-to-person, therefore. Units of Botox® use may vary to achieve optimal results. We are happy to schedule a free consultation and further discuss your customized beauty plan.